For two weeks every July the city of Boryeong becomes foreigner central for all of Korea. Yet, what is it that brings all of these foreigners to this small beach community in the middle of nowhere Korea. It isn't for the vibrant nightlife or the stunning beauty of the beaches. There are places throughout Korea with far better nightlife and far better beaches. Yet, something draws almost 2 million people to this city for during two weeks. Honestly, its the chance to get filthy, and I mean covered head to toe in complete filth. The Boryeong Mud Festival, or MudFest for short is a large party where the standing orders are to be completely covered in mud. In fact it is nearly impossible to come to this festival without taking at least one trip to the ocean to wash the mud off your body. The mud located in the Boryeong and Daecheon areas of Korea is renowned for its mineral properties. Many health spa's in Korea feature mud from this area in their spa treatments. It was an ingenious idea to hold a festi val that would draw millions of people to this small Korean town. 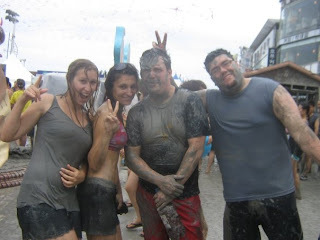 MudFest is a reason for foreigners to gather together in Boryeong and just generally have a good time. There are several different types of things that you can do there. You can spend all day lounging on Daecheon beach, you can cover yourself in mud repeatedly, visit the m ud prison, mud slip and slide, mud wrestling, mud rave, mud, mud, mud, mud, mud. There are also spa treatments and a carnival st yle atmosphere nearby. It is quite easy to head down here and spend several hours getting filthy dirty and just generally reveling in one of the few times that there are more foreigners around then Koreans. It actually seemed like English was the language of the day. Our day started with David and I meeting Drew at the Boryeong bus terminal at 11 in the morning. Luckily for us Drew lives in Boryeong and we had a free place to crash. We headed off to Drew's apartment to drop off our stuff and then made our way down to the beach to get really muddy. When we first got there we cased to surroundings and figured out that the best thing to do to start the day off was to take a swim in the mud pool. Well it's more like a wading pool but it's still filled with mud. After taking a quick dip in mud we wandered around and let the mud dry on our bodies. After this we ran down to the sea to clean up. We followed this up by liberally re-applying mud to our bodies and styling our hair with mud. After a rinse and repeat we partook in the mud prison. After the prison we decided to walk down to the carnival area to partake in some carnival games. We started with a dart balloon game which is probably the easiest carny game I've ever taken part in. Just don't miss a balloon with a sharp dart. After we had finished we won a hello kitty stuffed animal that I promptly gave away to a Korean woman who had been watching us throw darts. I didn't get her number but it was worth a shot I figured. To this David took offense because he had planned on giving that to someone and didn't tell me about it till after I had already given it away. I told him not to worry because we'd just come back to something like this and win another one (which we did later). After some batting cages we walked back up to the beach to clean off and head back into town for Dinner. Along the way we decided to stop and ride the Pirate Ship. Well, the Viking here in Korea is far more terrifying then the ones back in the states. The locking mechanisms on the ships here actually move at the upper limit of the ride. Needless this is quite terrifying and resulted in me holding the bar down every time we went up because our butts were coming off the seats. Not kosher if you ask me. After a quick stop at the Sauna that way we didn't have to wait for all of us to take showers we headed off to dinner at Pizza Hut. We were famished, and honestly needed some major sustenance because we were heading out later that night for Ji Sun's birthday. Ji Sun is Drew's friend from Boryeong. The plan for her birthday was to meet down near the festival and figure out what we wanted to do. Most the people who were there had already spent several hours if not days at the festival so the plan we made was to head back into town to Norae Bang for several hours. It was a great night of Norae Banging that led to numerous horrible renditions of great songs.